Tel Mora ("Tower Forest" in Dunmeris) was the northernmost of the Telvanni-held islands. It was constructed in the middle Merethic Era by Aldmeri explorers. It was the tower of the Telvanni Councilor Mistress Dratha, one of the oldest of the Telvanni wizard lords. Tel Mora was typical of a wizard tower in that it had a reasonable community living in smaller mushroom dwellings around the base of the tower. The construction of Tel Mora was also interesting, since the tower itself was set between two islands with a network of walkways over the water. Around 2E 583, Mistress Dratha fell mortally ill as a part of a plot by the Telvanni noble Savarak Fels to take her place as ruler of Vos. The plot was foiled by the Soulless One, and Dratha was restored to good health. The near-death experience caused Dratha to make a deal with a servant of Molag Bal, Xykenaz, to achieve immortality. Although the deal made her immune to aging, she was prophesized by Xykenaz to one day be killed by a mortal man. By the Third Era, all of the residents of Tel Mora had to be female to prevent the prophecy from being fulfilled. Males were allowed to shop in the town and get service there, but had to stay well clear of the tower itself. There was regular sea transport to nearby Vos, as well as Dagon Fel, Tel Aruhn, and Sadrith Mora. Females, however, found warm welcome in Tel Mora and plenty of conversation at The Covenant, the local social center. Females could also avail the alchemy shop in the lower tower, which was considered perhaps the best alchemical supply shop in Vvardenfell, supporting the traditional idea of women's natural propensity for healing and herbal magic. Dratha shared the Telvanni penchant for 'eccentricity'; in this case manifesting in an acute mistrust and hatred of males of any species, due to the prophecy concerning her death. While male Telvanni of high rank could talk to her safely and do chores, she was quite hostile toward male outsiders. 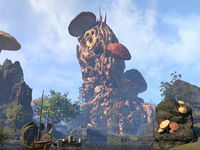 For game-specific, see the Morrowind and ESO articles. This page was last modified on 21 October 2018, at 07:13.